This article proposes a model of transparency, the idea that a good tool “disappears” in the hands of skilled users. The article then proposes a model of design as the management of a dynamic transparency. In use, we often want a tool to be transparent, but other times, in the show room or in front of guests for example, we may want the tool to call attention to itself. And finally, the article argues that design theory (and presumably design models) are best when they too are transparent. Quite often I find myself speaking to groups about usability, and one of the things I usually say is that a central component of usability is transparency. What I mean by this is that a product is usable to the extent that you don’t think about it when using it—to the extent that you see through it, so to speak, to the task you’re trying to perform. For example, a scalpel design is a failure if it forces the surgeon to focus on the scalpel itself rather than on the transection of tissue; a poorly designed control in your car is one you have to think about how to operate rather than operating it unconsciously while you focus on the road. The figure below, provided by Hugh Dubberly, summarizes what I’m talking about. This notion of transparency, however, should not be confused with simplicity, at least not a simple version of simplicity. A tool becomes transparent in use as the user develops skill, and therefore is simple for the skilled user, but not necessarily simple in any general sense, as the example of driving an automobile demonstrates. Admittedly, transparency as a criterion for usability applies most comfortably to products that are tools, but most products are, in fact, tools of one sort or another, in that their function is to allow you to perform tasks. It follows from these thoughts that a key task of the designer is to create things that disappear. But this is something of a contradiction, because, for one thing, design has its roots (and still one foot) in the fine arts, and the last thing a fine artist wants to create is something that disappears. Great art stops you in your tracks; it gobsmacks you, as my British friends say. It’s anything but transparent. Or is it? Historically, in painting and sculpture at least, a prominent trend—never the only trend, of course, but a prominent one—was to achieve transparency of the medium, to allow the viewer to see through the paint on the canvas to Pope Leo IX or to the exotic Kasbah, or, in sculpture, to see the war hero or the saint rather than a hunk of bronze or marble. Then, with the advent of photography, among other things, that traditional form of transparency was no longer interesting. Hence, the whole concept of formalism, wherein the viewer is reeled back to the paint on the canvas and the bronze material itself [1,2]. Anyway, back to design. The question I want to pose is: What does it mean to design for transparency? However, the question itself probably underestimates the complexity involved (even before we get to an answer). Take the example of a clear drinking glass. The glass is transparent in that you can see inside of it and behind it. But it’s not completely transparent in that you can see it’s there, so we might call it semi-transparent. Well vs poorly designed tools. However, in use it should become completely transparent, in the sense that you shouldn’t have to shift your focus from a conversation you’re having to the glass in order to take a sip of water. But this transparency of use will be different depending on how easily the user can achieve an affirmative grasp. A glass that slips out of your hand without a firm, intentional grasp will require attention for the person with poor hand control, so its transparency could be altered by alcohol consumption or by a disability. But when the glass sits on your table as the guests walk up for a dinner party, it should be conspicuous as a thing of beauty, only to become transparent to the guest who uses it. Likewise, you want a car to be highly conspicuous as a work of art in the showroom, but completely transparent to the driving task while out on the road. To approach this problem from another direction, a central fact about being human is that unconsciousness is often a good thing and consciousness is often a bad thing, despite the fact that your mother was always telling you to pay attention and that everyone who’s encountered anything horrible seems to found an organization to “raise awareness” of their particular horror. Eugen Herrigel discusses this phenomenon in a particularly elegant way in describing his struggles to eliminate his awareness of the bow and arrow in achieving skill in archery . He uses this as a vehicle for explaining Zen Buddhism, but that’s another story. 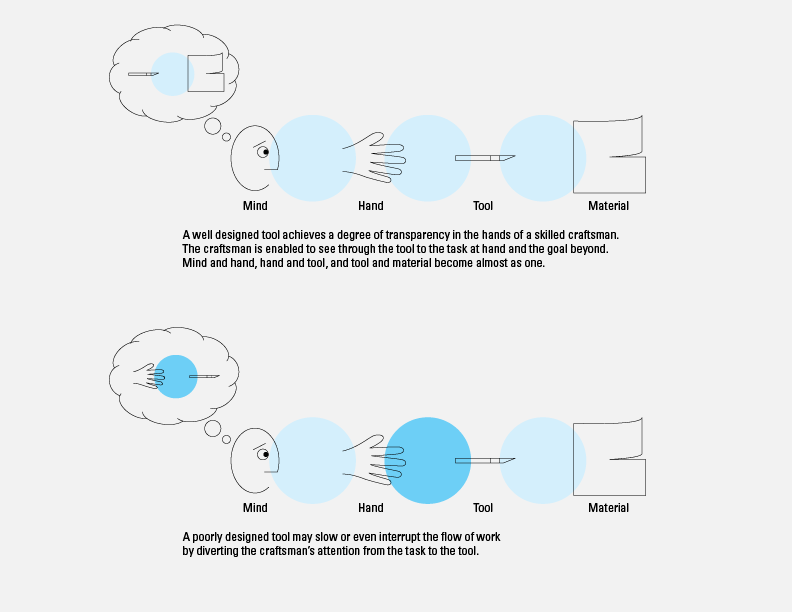 At any rate, it seems to me that consciousness is generally overrated and overemphasized, probably because those who’ve traditionally developed theories of mind were biased toward their own skills (that are very much in the realm of the conscious) rather than toward the skills of, say, artists or craftspeople. As William James put it in criticizing the psychologists of his day: “The great snare of the psychologist is the confusion of his own standpoint with that of the mental fact about which he is making his report. I shall hereafter call this the ‘psychologist’s fallacy’ par excellence” . The point, then, is that much of what human beings do involves the loss of awareness of the tools they are using, and this loss of awareness, when it’s associated with the development of skill, is generally a good thing. It follows that the designer of a tool is designing for a user who should, ultimately, lose awareness of that tool. Thus, the case I want to make is that one of the reasons product design is so hard is that the designer has to be something of a magician who creates things that disap- pear and reappear at just the right times, for just the right people. A great product jumps out at you and demands that you buy it, presents itself clearly to you as you learn how to use it, then disappears as you go through the learning curve—or, even better, doesn’t require a learning curve, so it disappears just as you begin to use it. It provides transparent access to things beyond it, as great Renaissance paintings do, but, also like great Renaissance paintings, exudes a conspicuous beauty. So one thing that great design involves is the careful handling, the competent management, the superior molding, or the confident manipulation—whatever you want to call it—of a dynamic transparency. The inverse is that you can’t be a great designer unless you can control transparency with assurance. That is, the mastering of dynamic transparency is a central skill of the designer. But, interestingly enough, the mastering of dynamic transparency is itself transparent—it’s a crucial but largely tacit skill that isn’t particularly taught to or focused on by designers. Which leads to another question: Does this concept of transparency, as an important criterion for the successful design of a tool, also apply to intellectual tools? As with a great physical tool, a powerful intellectual tool should be a beautiful thing to contemplate. However, isn’t a really productive intellectual tool one that you don’t need to think about, but rather just use productively? Let me give some examples. Newtonian physics is filled with helpful intellectual tools for seeing how the world works. Simple vector geometry, for example, tells you that a billiard ball will come off the cushion at the same angle from which it was approached. Most of us probably take this for granted, but we can thank our early physics classes for first teaching us this simple principle. Another example is William Labov’s insight that accents are driven more by cultural values than by more obvious factors such as the length of time one has spent as an expatriate. Suddenly all sorts of phenomena start to make sense—why you can cut Henry Kissinger’s accent with a knife, despite the fact that he’s been living in the U.S. since he was 15, why New York accents sometimes get stronger when New Yorkers move to L.A., and so on. In the realm of design, a good example is J. J. Gibson’s concept of affordance . Gibson’s idea is that one can describe objects in a user-centered way that maps onto what people can do with objects, and, therefore, how people see objects (i.e., as a set of affordances, or properties that afford certain actions). It’s no surprise that this idea has made its way into the design world, since one way to see the designer’s job is as the creation of physical objects that are perceived and used in predictable ways by classes of people. Thus, it seems to me that the true intellectual in any field is one who creates and uses intellectual tools that become transparent to him/herself and others, who creates and uses sophisticated intellectual tools that allow for the achievement of practical results. The pseudo-intellectual, on the other hand, is the person who creates and uses intellectual tools that may be impressive to contemplate and talk about but that don’t lead to practical results. The pseudo-intellectual is someone who is always talking about, say, Jacques Derrida (a reference that somehow immediately makes me skeptical), rather than using the underlying intellectual tools that Derrida’s work provides (assuming there are some) to produce better work. Likewise, to the extent that the pseudo-intellectual comes up with new ideas, they may be better at dazzling than at leading to anything important. It’s the difference between the bodybuilder who’s always looking in the mirror and building muscles to show off versus the athlete who’s building muscles to win races. So, perhaps this notion of transparency, applied to ideas, can help us differentiate between intellectual bodybuilding and intellectual athletics—between good and bad intellectual tools—just as it helps to differentiate between good and bad physical tools. A new idea that involves lots of neologisms, for example, will inevitably be poorly understood or misunderstood—and, to the extent that it’s understood at all, be understood differently by different people—so is usually (not always) a poor candidate for a good intellectual tool. A poor intellectual tool is one that doesn’t allow you to get beyond it, that forces continual contemplation of the idea itself rather than its productive application. A good intellectual tool is one that disappears as it allows you to do things you couldn’t do before or at least couldn’t do as well. So, applying this distinction to design theory, we should ask of the design theorist whether or not his or her theory becomes transparent to its users—hopefully, actual designers rather than just other design theorists. If not, it remains intellectual bodybuilding that may impress, but doesn’t really lead anywhere. In thinking about my own 20 years of overeducation, I’d say that my professors displayed way too much intellectual bodybuilding and not nearly enough intellectual athletics. I believe that the psychologist Kurt Lewin was thinking along these lines when he penned one of the great lines of all time: “There’s nothing more practical than a good theory” . 1: Greenberg, C. “Avant-garde and kitsch.” Partisan Review 6 (1939), 34-49. 2: Greenberg, C. “Towards a newer Laocoon.” Partisan Review 7 (1940), 296-310. 3: Herrigel, E. Zen and the Art of Archery, 1953 (originally published in German in 1948). 4: James, W. Principles of Psychology Volume I. 1890. 5: Gibson, J. The Ecological Approach to Visual Perception. 1979. 6: Lewin, K. Field Theory in Social Science: Selected Theoretical Papers by Kurt Lewin. 1952. I would like to thank my friends and colleagues at the 2012 High Ground Design Conversation hosted by Michael and Katherine McCoy, where I presented an earlier version of this paper. They provided a number of thoughtful comments, which influenced the final version. Hugh Dubberly, in particular, followed up with several helpful suggestions, including providing the diagram included in the article. Stephen B. Wilcox is a principal and the founder of Design Science (Philadelphia), a 30-person firm that provides services designed to optimize the human interface of products—ethnographic research, human factors, and interaction design. He is a member of the Industrial Designers’ Society of America’s (IDSA) Academy of Fellows.